When first starting paintball, don’t start with a finicky, expensive, high maintenance top end marker. You need a paintball gun that’s reliable, easy to care for and super durable. The Spyder Xtra is one of the best beginner’s markers for learning the game of paintball because it’s so easy to use and cheap priced. After playing with the Xtra, you will be amazed at this gun’s features and excited about its performance. The Spyder Xtra is definitely a top end gun in the low end price ranges. The Kingman Spyder Xtra is a .68 caliber, hopper fed, semi-automatic tournament style paintball gun that’s great for whatever game you like to play. This marker has plenty of speed and control for doing well in speedball competitions but yet powerful and fierce looking enough to be used in scenario woodsball as well. The Xtra features an external velocity adjuster so you can customize your range for the situation you’re in. The Spyder Xtra paintball gun will let you play for hours without interruption because its technology makes it so efficient. Featuring Kingman’s patented Air Efficient Eko Valve System, the Xtra can shoot up to 1,600 shots from a standard sized 20oz CO2 tank. For even better performance try a compressed air tank, as the Spyder Xtra can use either CO2 or hpa. An ergonomic trigger frame with two finger trigger allows for easy speed shooting through an accurate 10 inch micro ported high performance barrel. The Spyder Xtra tournament style paintball marker will let you play as hard as possible for every session. This gun is incredibly durable and scratch resistant because of its dusted matte anodized finish; this coating also makes cleaning super easy. The Xtra paintball gun is also a great gun to learn on because it’s so easy to take apart for servicing; its striker plug can be removed in just a few minutes and without tools. 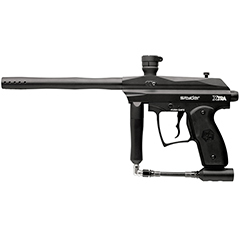 The Spyder Xtra is a top quality basic model paintball gun that’s excellent for beginner to intermediate players. When you buy it from our online store, you will get the best price found on the internet with top rated service to ensure you have the best experience possible. If you have questions about the Spyder Xtra or any of Kingman’s products, please contact us and we will be glad to help you.